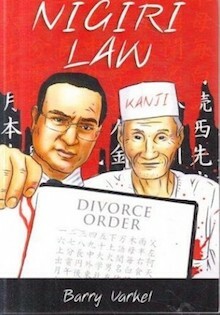 Nigiri Law by Barry Varkel – So many firsts…first funny book on the South African law process, first time I have heard of a stand-up comedian who is a qualified and practicing attorney and author on top of that and the first time I have done a book review for Tech4Law. Barry Varkel, referred to by his client as “Mr Belly” tells of his experience handling a divorce matter for his client, a sushi restaurant owner who speaks very little English. There is a great amount of humour, including the scary trip to court for his bewildered client. The funny story takes a rather unexpected twist when Arata takes a trip in between court appearances. Barry’s writing manner illustrates the foreign accent cleverly. I enjoyed the book. A number of times I found myself trying to persuade Arata to take a different path in my mind. It is a worthwhile read for all adults, whether involved in the legal fraternity or not. An incredibly hilarious romp thru the legal profession, sparing no sacred cows (or dogs if that’s your palate preference). I’m struck by how versitile this lawyer is – is he a comedic lawyer or a comic who happens to be a lawyer. All I can say is that the book is very funny, so funny that a flight attendant asked me to lower my voice as I read the book on the airplane toilet. I enjoyed his witty observations abt the human condition which I found more accurate than most comics. Iwan, thanks for the positive comments and feedback. I will make sure Barry sees them.